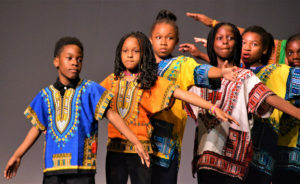 ESF Dream Camp Foundation | Dream Camp Fine Arts Program Goes B.I.G. Each year, students in Senior Camp get to choose to participate in Music Production, Dance, or Art as a part of our Fine Arts Program. This summer’s Senior Camp Show was titled “Go B.I.G” (Be In Gratitude). Students worked together to produce a piece that focused on one or two of the 8 ESF Virtues of Character: Kindness, Respect, Community, Positivity, Effort, Resiliency, Trustworthiness, and Gratitude. Students in Music Production wrote, produced, recorded and performed a song that was based on their virtue. Dancers chose music that expressed their virtue and choreographed a piece that articulated what it meant to them. Artists created murals and collages that visually depicted the virtue. All the students hard work was then performed and/or displayed during the Senior Camp Fine Arts Show, where family and friends got to see their final creations.